wagamama at the Red Sea Mall ... more communal seating and fewer screen dividers. Following its design success on two wagamama restaurants in Saudi Arabia, LXA has been commissioned to design a third outlet, this time at the Red Sea Mall in Jeddah. LXA, the award-winning hospitality interior design consultancy, continues its successful relationship with Japanese inspired pan-Asian eatery wagamama, by expanding its proven design portfolio into new areas of Saudi Arabia. 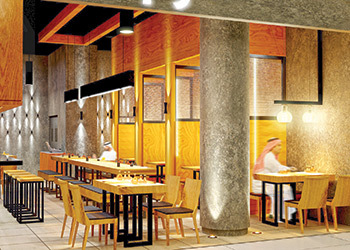 Following the success of the Jeddah outlet on Al Hail Street, a second LXA wagamama design collaboration has recently opened at Faisaliah Mall in Riyadh. Additionally, the company has also announced the construction phase of a third venue, set for completion towards at the end of 2017, in the Red Sea Mall Jeddah. 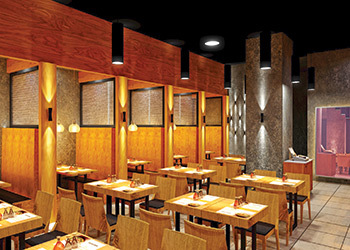 This project is the result of a franchise partnership with Prestige Restaurant and Cafes Company. With over 10 years of success in the GCC design world, LXA has been instrumental in marrying the pan-Asian food operation’s DNA with Saudi cultural social trends, striking the perfect balance between minimal design and high expectations around comfort. LXA’s interpretation and application of wagamama’s ‘Kaizen’ concept successfully unites this popular cuisine with a design concept resulting in a balanced, harmonious and welcoming space. “Kaizen, Japanese for ‘good change’, represents the perfect description of what you can expect to experience away from the hustle and bustle of the busy streets of Jeddah or the crowded malls in Riyadh,” says Grant. Throughout the restaurant space, the customer is treated to an aesthetical experience through every wall and every surface. Crown-cut natural oak, Carrera marble, Saint Laurent marble, concrete, and a pitched rose-coloured mirror make up the minimal yet sleek design features that accentuate the overall look and feel of the restaurants. The simplicity of wagamama’s material palette does not in any way hinder the ability to create a series of impressive features. “Whether it’s the live cooking experience, the pixelated wall lights, or even the introduction of copper ring mesh, it is all a feast for the eyes bringing together a harmonious and animated space to complement your delicious meal,” she says. wagamama at the Faisaliah Mall ... aesthetic defined by wood and crisp furnishings. 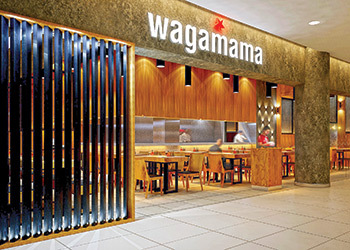 In the Saudi market, however, the brief was to adapt wagamama’s open and communal dining experience to one that is better suited for the local culture and way of life, without losing the integrity of the brand, says Grant. “By strategically placing the open kitchen and juice bar as the central spine in the Faisaliah Mall in Riyadh, we were able to accommodate the segregation of the family section from that of the singles section. Careful consideration was also given to the development of screens at partitions between booths and other seating, which also helps to accommodate the more conservative families that choose to visit these restaurants,” she continues. She adds the Jeddah Al Hail location was much easier to address in that there are two floors; one for families and one for singles. The design aesthetic in both locations follows the Kaizen principle and forms a down-to-earth approachable and comfortable casual dining space where the food is the hero but the design makes for a great setting to enjoy a meal. The wagamama outlet at the Red Sea Mall will have more communal seating and fewer screen dividers. “Privacy is still a key factor but with Jeddah being a little more open than Riyadh, there is more opportunity for open plan,” she adds. Headquartered in the UK, wagamama is a leading casual dining operator offering Japanese inspired, pan-Asian cuisine in a casual but vibrant setting. LXA, formerly Luxe Interior, is an interior design, project management and development company that operates throughout the UK and the Middle East.